Yasmyn is five years old and attends Elk Grove Montessori School in California. 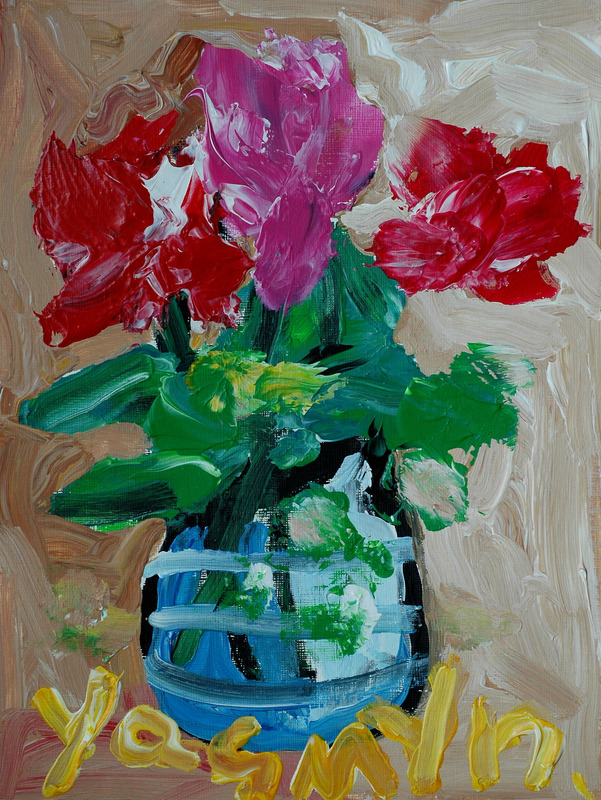 Her art, “Roses in Vase“, was selected as a Top Ten Winner in our Fall 2012 national art contest. Yasmyn loves to play with her 3-year-old sister Gianna, her baby brother Niegel, and her best friend Autumn. Her favorite color is pink (which you can see reflected in her winning art). “Roses in Vase” was inspired by the flowers at Yasmyn’s school. Both Yasmyn and her grandmother love flowers, and Yasmyn really wanted to paint the ones at her school. Yasmyn’s future goals include being a princess and continuing to paint. She also wants to be a good older sister to her brother and sister.